Not done as much as I had planned on the crafting front, but, I have made good headway on my Debbie Abrahams Mystery Blanket from 2016. Out of the seven strips and 4 borders , I have managed to complete, 4 strips, 1 border and a few squares. To save my arms from the weight of the completed blanket when doing the borders I am knitting the side borders on the strip before I sew them together. So far I have sewn two sets of strips together and am feeling a sense of completion. What I like about Debbies Blankets are the range of techniques , colours and yarn choices. The 2016 one has beading, bobbles, cables, lace, intarsia, swiss darning and stranded knitting. Each square feels like one has actually completed an item, which I guess one has. I am on track to complete this by the end of June. After abstaining for a few years, I finally succumbed to my friends request to go to the Knitting and Stitching show at Alexandra Palace, more commonly known as Ally Pally. Regular readers will know I have been trying to down size my craft stash for a few years. The yarn stash has halved but the fabric stash doesn’t seem to be moving at all. Anyways,back to Ally Pally. We started the day with a lovely breakfast before the show opened so we were raring to go when the doors opened. We had a plan, to start at the far end and walk up and down each aisle. I was prepared, I had a short shopping list, I fell at the first aisle. The Lovliest Yarn Company had a lovely shawl in the, most, gorgeous, soft yarn, Juniper Moon Farm Herriot. It was love at first touch, 100% baby alpaca, so soft, so scrumptious, my will power went and I purchased the yarn to knit the shawl. The shawl on display was in green and I almost bought that colour but decided against it and went with……. red. I was okay for a while and concentrated on hunting for the items on my list, I found the bobbins for my sewing machine , then it was the hunt for boys patterns, Harry’s red yarn and magazine subscriptions. If I am going to subscribe to a magazine, I prefer to do it at one of the shows. The price is generally a bit better and normally the free gift is much better than getting it through an offer in the magazine. Unfortunately most of them were doing three issues for a pound or six pound and then a rolling quarterly subscription which I don’t want. I prefer to pay for an annual subscription with a one off payment , so if I don’t require it after the year , there’s nothing to do, it just ends. Knitting magazine however were doing a fabulous deal. They gave you the current issue, a ten ball yarn pack, out of a choice of two and a years subscription of 13 issues for £50. 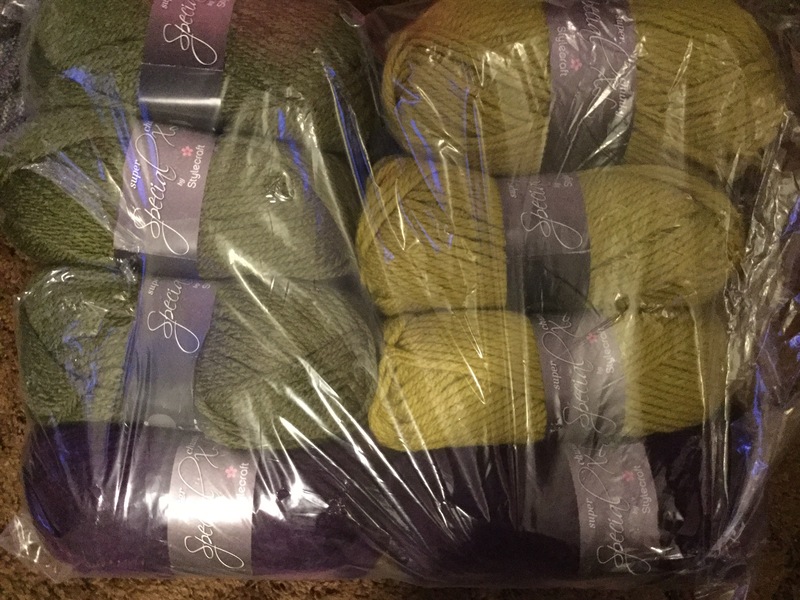 My yarn choice was the mixed colour Stylecraft Super Chunky Special XL. This is destined to be hats and scarves for various family members.It also came with six pattern books, which I gave to a friend. Harry yarn was next on the list. When I told Harry I was going to the knitting and stitching show, he asked me to get him some red yarn to knit him a sweater. As I have loads in the stash, I didn’t want to pay too much and I pounced on a bag of King Cole Galaxy chunky at Black Sheep yarns, it was only when photographing the yarn tonight, I realised I have made a boo boo. The yarn has sequins in it. Doh, I guess this is now Evalyns. 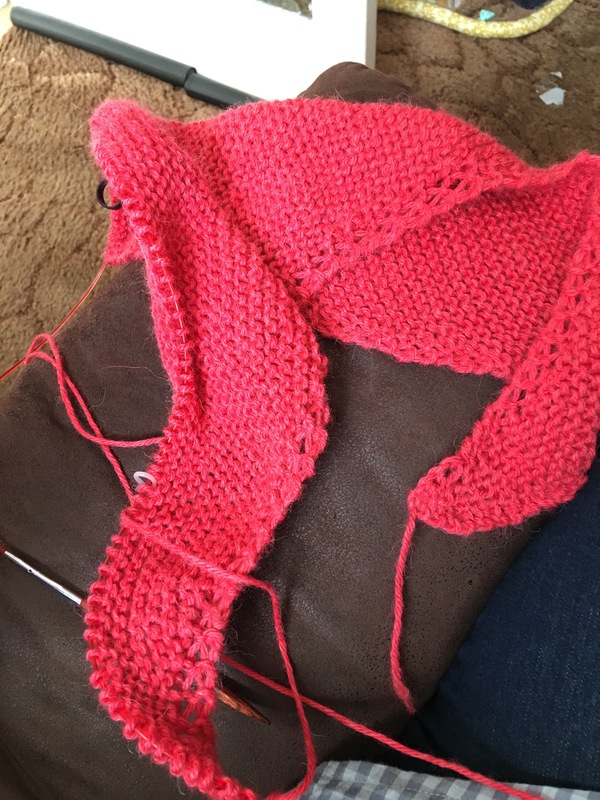 I have already started the Touch Me shawl pattern which is a free pattern on Ravelry, if you want an easy shawl, relaxing to knit and looks good, knit this, I cannot praise this pattern enough. This is where I am doing things in reverse. 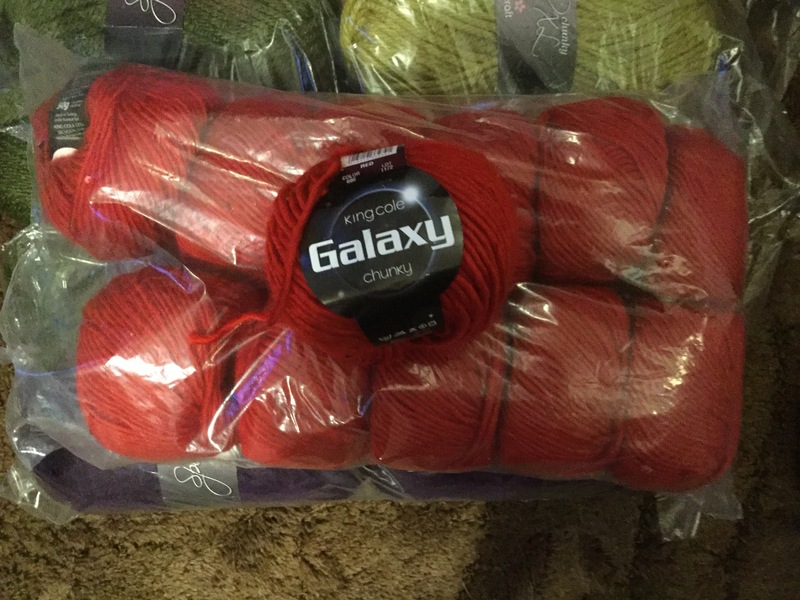 I am planning on making and using the yarn and fabrics I bought at the Knitting and Stitching show instead of adding it to the stash and using the stash first. There are still some bits from stash on the needles but I need to use these new bits first. For me this year seems to be the year of clubs and knit a longs -KAL. I signed up to a mystery mitten KAL but never got around to starting it. I signed up to Fiddlesticks mystery shawl which I am not sure if I will be actually knitting but we are only on clue one. As usual I am knitting Debbie Abrahams Mystery Blanket, not that I need anything to sell it to me but it was the lace knitting that sold it. I am on track so far but it’s only been one month. I love this years colours and theme so far. Late last year I discover Erin Lane Bags, they are doing a Year of Winter ending in Christmas club. Alternate months you get a kit and a project bag based around the Narnia characters. 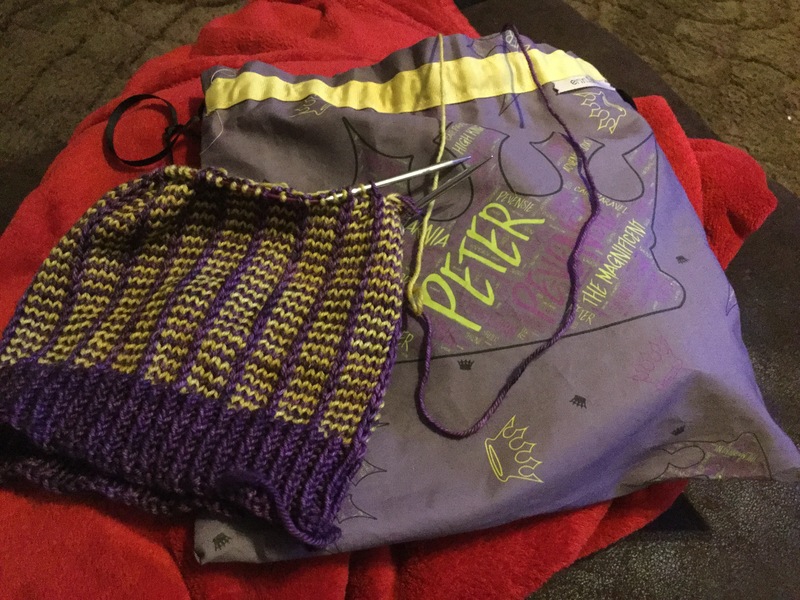 I am knitting the Peter hat already and have to say the yarn included with it (Holiday yarn) is gorgeous to knit with. The project bag is very good quality and I would buy one from them. It is a nice easy design and I will be using this as my travel and hospital project. The Kindred Spirit Shawl is still in progress but as it is such a pleasant easy knit, this is my mindless knitting so is being picked up between projects. I have been very busy crafting this year. I have been off work because of a chest infection which means that I have had time to finish some items. Harry’s pirate sweater has been finished. The shawl I have made for my daughters wedding has been blocked and I have knitted a couple of rows for the vibrant sweater. I do enjoy knitting the vibrant sweater however, as soon as I start making mistakes I stop and come back to when my mind is clearer. This year I still plan on only knitting and sewing from stash, but this has got me thinking. I always try and stash bust only knitting and sewing from stash, but what about new books and patterns? Should I also only knit and sew from these? It has me in a bit of a dilemma. You know how it can be , you want to use a particular yarn but you can’t find a pattern to match in your personal library. You log in to Ravelry and find the perfect pattern for it, if you’re lucky it’s a download , if not you purchase the book. What should one do? I know there are people who say don’t worry about it , but with three ful to the brim tall, wide bookcases surely I must have a pattern to use . Today’s fall from the pattern stash busting was for Tilli Tomas Symphony Lace. I have the American Beauty colour way, a gorgeous red with matching beads. It is a lace weight yarn and really needs something simple to do it justice. 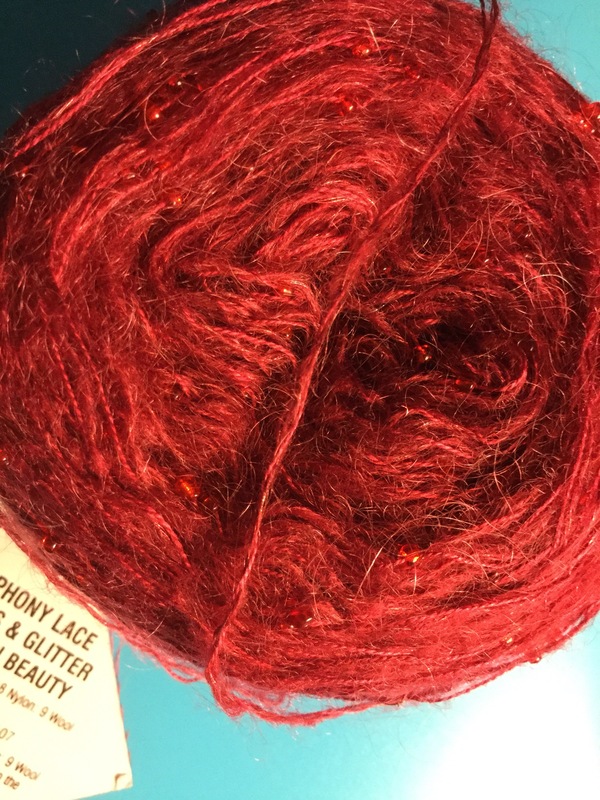 This is one yarn whose beauty would detract if there was an intricate pattern. I had a wrap/scarf pattern I would use but it didn’t jump out at me to say knit me. I found the perfect pattern in Kindred Spirits by Boo Knits. This a simple but elegant patten which will do the yarn justice. I can’t wait to start it. So that was yet another pattern bought because I didn’t find inspiration amongst the thousands of patterns I own. Then I discovered two balls of Aran yarn which I thought would make a great top for one of the grandchildren. Once again I couldn’t, find a pattern for this. I did find a really nice one buy on Ravelry but on this occasion I am going to hold off buying it until I have knitted another item for them from stash both yarn and pattern. If I can’t find a pattern for it in my library I am going to donate it to a good cause. I am still undecided as to whether I should be buying anymore patterns but I feel that if I buy a new pattern book I need to destash an old one. I need to be more ruthless with my books. There is no point in having a book where you know you will not be knitting any projects from it and even looking through takes less than a minute. I love physical books but If I feel I have too many it’s time to donate them to a good cause. Most will go to the charity shops or craft groups and some will go to people I meet who are new to the craft to inspire them. In this case my PHD stands for Projects Half Done! I still have a number of sewing projects to be done but I am working slowly but surely on the vibrant sweater by Marie Wallin’s from an issue of Vogue Knitting. I only have the body to knit and am aiming to knit a minimum of two rounds per week. Cosy by Kim Hargeaves is going well and I only have the front to knit. This years Mystery Blanket by Debbie Abrahams has made progress but I started to get a little bored so I have shelved this for the moment and have decided not to knit next years even though I know I will regret it at some point. Although I still have a number of projects on the go I have decided to cast on a pair of socks so that I can knit them at work. That has to be mindless knitting. The craft culling is going well although I am getting into my card making again so I need to be careful I don’t splash out on card stuff. I really need a good day so I can pull out everything from the workshop and sort out my notions.